As people age, their metabolisms naturally slow down, making weight gain increasingly likely over time. However, during menopause, many women experience rapid weight gain that seems out of step with this natural, gradual process associated with aging. The suddenness of the weight gain can be particularly distressing for women, especially as it is often experienced in tandem with other symptoms. While the full reasons behind rapid weight gain during menopause are not known, it is thought to be related to the decrease in estrogen. Luckily, there are strategies available to counter some of the worst effects during menopause. Why Does Menopause Cause Rapid Weight Gain? 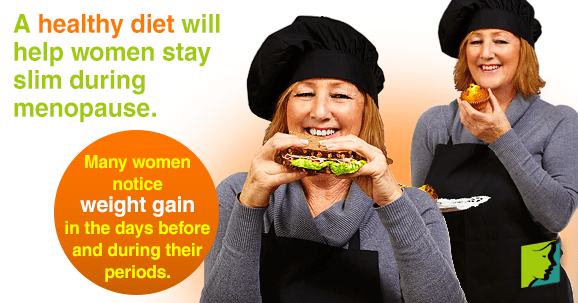 On average, women will gain between 10 - 15 pounds during the menopausal years. This change is most often attributed to hormonal fluctuations in the body. During menopause, weight is often redistributed to the areas around the abdomen as opposed to the hips, thighs, and backside. Because of changes in estrogen levels, women tend to put on weight, and when they do, it is consolidated around the midsection, often accentuating the problem or making the weight gain seem greater than it is in reality. Rapid weight gain is not restricted solely to menopausal women. Many women notice rapid weight gain in the days before and during their period, when hormone levels drop. They can gain several pounds and often feel bloated, although they generally lose the weight again after their period. This is an example of how low hormone levels make you retain fluids. At other times, water retention and fast weight gain can result when women take certain medications, including contraceptives containing the hormone estrogen, anti-inflammatory drugs, steroids, and some antidepressants. Estrogen affects factors that increase appetite and influence fat storage. This is why during menopause, when hormone levels are changing drastically, it can be difficult to maintain a regular weight. During menopause, estrogen levels decline to the point where the body stops ovulating completely. In order to compensate for the loss of estrogen, the body starts to convert fat cells into estrogen. This forces the body to work harder, as calories are converted into fat cells, which don't burn calories as effectively as muscles, thereby precipitating weight gain. The body also produces less progesterone during menopause. Less progesterone causes higher water retention rates, which in turns produces the bloated feeling and look that some menopausal women experience. However, water retention and bloating tend to disappear after a few months. It is important to remember that crash diets or strict regimes where one loses a huge amount of weight are never recommended, particularly since sudden weight loss or gain can exacerbate or precipitate other menopausal symptoms. For a more orderly transition phase and to help regulate the rapidity of the weight gain, many women find natural herbs and alternative treatments to be helpful in regulating weight caused by hormonal swings. For more information about rapid weight gain as a result of menopause, follow the link below.